Rare, but extremely large, explosive super-eruptions Magnitude 8 and above have occurred throughout geologic time. A Magnitude 7 event seems to occur on average one or twice per thousand years, and a recurrence of even these presents a significant challenge for future societies. Rare, but extremely large, explosive super-eruptions Magnitude 8 and above have occurred throughout geologic time. How frequent they have been, and will be, has been estimated in the range of one per 100,000 years. With the latest at 74 ka ago, human society should perhaps not be over concerned about such events. However, the most recent attempt to estimate a mean return period for Magnitude 8 events is one every 17,000 years, which puts a different slant on the future likelihood of a super-eruption occurring. A Magnitude 7 event seems to occur on average one or twice per thousand years, and a recurrence of even these presents a significant challenge for future societies. Super-eruptions of silicic magma lead to the catastrophic formation of huge calderas, devastation of substantial regions by pyroclastic density currents or flows and their deposits, and ashfall deposits that can cover continent-size areas. Widely dispersed fine ash means that the effects of future super-eruptions may be felt globally or at least by a whole hemisphere. The most widespread and long lasting effects are likely to derive from the volcanic gases released. These will remain for several years, promoting changes in atmospheric circulation and causing surface temperatures to fall in many regions, leading to short-term temporary reductions in light levels and severe and unseasonable weather (volcanic winter). However, the radiative impacts of the aerosols are not expected to be severe enough to cause major climatic changes, and, indeed, some super-eruptions may not release huge amounts of sulfur gases. 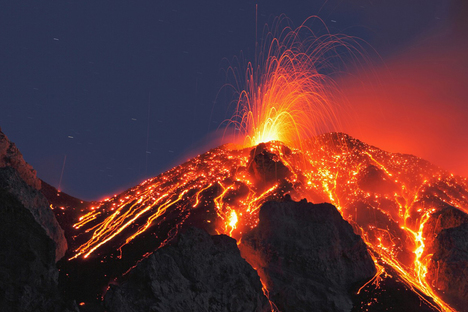 If a future super-eruption was predicted, what would, or could, society do? Major disruptions to global societal infrastructure can be expected for periods of months to years, and the cost to global financial markets will be high and sustained. Preparation for such low probability but high consequence events is difficult to imagine, yet some modest early measures can be considered. Volcanologists should refine geologic histories and ensure at least baseline monitoring of candidate volcanoes, and they should consider how they will judge the likelihood that an impending eruption will be of super eruption scale.